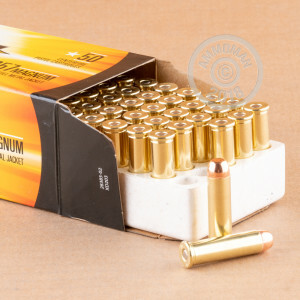 Grab a few of these 50 round boxes of .357 Magnum ammunition for your next range trip. These cartridges are well suited to both outdoor and indoor shooting, firing a 158 grain full metal jacket bullet at a muzzle velocity of 1,545 feet per second. 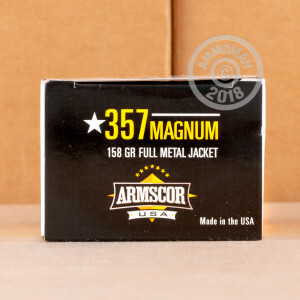 These cartridges are loaded in Stevensville, Montana by Armscor USA, the American division of Philippines-based Armscor (which produces both firearms and ammo). Place an order for $99 or more at AmmoMan.com and enjoy free shipping--no shipping calculators to finesse or codes to redeem.